His official title is a movie director, but if you include various non-official titles, he can’t be described in one word. His name is Kim Yong-hwa, whose movies Along with the Gods parts 1 and 2 each attracted 10 million viewers?a first in Korean film history. From imagination to reality, Director Kim is now planning, directing, and producing the movies all at the same time. He is at the heart of the Korean film industry, which requires money and personnel. 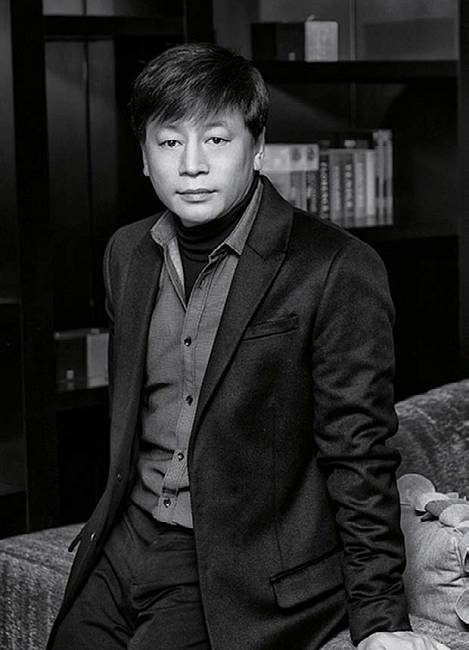 Dexter Studios, established by him with his own money, has been working on the computer graphics(GC) for many Korean films. For the majority of CG work, one doesn’t need to go to the US anymore. In terms of bringing to life the desired visual images, the studio’s work has been recognized internationally too. The company plans to make inroads into the market in China. The studio’s headquarters employs 350 people, and at its Chinese branch, owned 100 percent by Director Kim, are 90 more. Kim decided to major in film studies simply because he loved movies so much and making films was the only dream he had. After his debut film Oh! Brothers, he directed box office hit movies 200 Pounds Beauty in 2006 and Take Off in 2009. From the idea of going beyond the limitations of the Korean film industry that is totally dependent on Hollywood, he established Dexter Digital (now Dexter Studios), a company that specialized in creating VFX. His ambitious movie after the establishment of the studio was Mr. Go which brought a giant gorilla to life on screen. In 2013, the movie was the first in Korean film history that features a character, a gorilla named Ling Ling, made 100 percent by computer graphics. Its production budget was KRW 30 billion, but failed to become a hit, attracting only 1.32 million moviegoers to the theater. The fruition resulting from the lessons learned from the failure and cinematic technicalities of VFX was the movie Along with the Gods. At first, he couldn’t easily say yes to a proposal of making a movie of the web cartoon Along with the Gods, written and illustrated by Joo Ho-min. The story was very interesting, but he felt like it was not his thing to do. Four years later, he accepted the proposal when he was asked again. This time, the project became something he wanted to challenge and make happen. Director Kim took courage to direct the movie. The movie was made only with a tenth of a Hollywood blockbuster movie budget. The first and second parts of the movie were filmed and produced at the same time, which was an unprecedented way of producing Korean films. Kim said he was worried too. If the first movie of the series fails, the second one automatically becomes a disaster. Also for a movie director, shooting the second movie of a series without seeing the reviews of the first one might be a fearful prospect. Kim said this very unusual production process was a reckless challenge. So what was the biggest difficulty for him while shooting the Along with the Gods? Kim didn’t want this reckless challenge to become a failure and had 1,500 viewers monitor the movie before release. Nowadays when even a smart phone in your hand, let alone TVs, provides high quality entertainment, Kim thinks the best quality of commercial movies is positive spectacles. Along with the Gods became a great hit as it removed unnecessary bits and emphasized more spectacles, writing a new history of Korean films. The record of the “sequel was also international. In August last year, the second movie recorded a profit of USD 1.2 million on its first day of release, topping the box office in Taiwan. “I’m so happy,” said Director Kim, and his words show how his painful memories made it happen by challenging himself so many times. The great thing about blockbuster movies is that they allow the audience to experience something that can’t happen in the real world. This can only be made possible by visual special effects. In this sense, the success of Along with the Gods was expected as it offers a vivid experience of hell. The movie contains more than 2,200 scenes of special effects. In a press conference, Kim said he was so surprised that he even doubted the work was made by him. The movie based on the story of the web cartoon highlighted the VFX technology that Kim had been studied and invested in. The technology produced by Dexter Studios achieved more than 90 percent of the technical effects made by Hollywood. Thanks to this, the movie boasts many spectacles. Kim successfully showed the fur of the tiger and wolves so vividly with the effects and brought spectacular scenes of the seven hells with themes of water, fire, steel, ice, and sand to the screen. For the water hell, the scene was so realistic and vivid, as if seeing Niagara Falls in front of your eyes. Director Kim attributed the success of the movie to the actors and staff members. With Along the Gods, Kim received acclaim both from the film critics and the audiences, but he says the film could’ve been better. Now many moviegoers are expecting the future production the third and fourth parts of the Along the Gods series, one of the greatest the box office hits in Korean history. Kim, who ought to be more excited than anyone else, however, is rather cautious about the prospect of making another series. “There are no reasons not to make another series for Along with the Gods if the audience wants. But I need to discuss it with the actors. If I really make them, I need to thoroughly reflect on the story, if it’s really what the viewers of the first two Along with the Gods want. Recognized internationally for his work of VFX and films whose quality goes beyond Korea and abroad, Director Kim is set to work in Hollywood through a collaboration with POW! Entertainment led by Stan Lee, the creator of Marvel Heroes and the President of Marvel Comics, an opportunity he had dreamed of for a long time. Last year, Prodigal, Kim’s Hollywood debut movie, was featured at Comic-Con, a world-renowned entertainment festival that presents the worlds of characters in pop culture such as comics, novels, animations, movies, dramas, games, toys, and action figures, and there was a launch show that received attention of the international film world. Prodigy is Stan Lee’s original superhero story, and Lee and the production crews who have watched Kim’s work with interest suggested that Kim direct the movie. Prodigal is currently in production with POW! Entertainment, Luka Productions, and Director Kim’s Dexter Studios, and the film is expected to be released in 2019. Kim has made investment in and produced many new directors’ films including his own. He says his dream is to make his company the next Disney in Asia.